Rich Fellers and Flexible won the opening World Cup Qualifier at Thunderbird Show Park. Photo By: Totem Photographics. Langley, BC (June 8, 2010) – Thunderbird Show Park welcomed international riders from four continents to the CSI2*-W Keg Steakhouse & Bar World Cup on Saturday. Twenty-six entries from Canada, the United States, Ireland and Venezuela challenged Peter Holmes course, but with a technical triple combination and 1.60m vertical at fence seven, just three advanced to the jump-off. Rich Fellers and Flexible were flawless through two rounds to finish with the only double clear of the day and a win in the season’s first World Cup class for the FEI North American League. Brian Morton and Spitfire were the first to take a rail in the triple combination, but it would prove a downfall for a third of the riders, including Chris Pratt and G-5. Pratt was quick to kick up his speed on the back half of the course and posted a fast time that put him at the top of the four-fault group. But while the combinations were certainly a factor, it was unlucky number seven that narrowed the field. Barrios on G&C Quick Star ensured a jump-off with a ride that gave spectators a good look at the power and scope of Gustavo & Caroline Mirabel’s KWPN mare. Bond also made it through with a steady ride on her powerhouse 11-year-old gray Zangersheide gelding, Chivas Z. After a few quick changes to Holmes course, Fellers was first in for the jump-off. Seeming as though he barely touched the reins of his Irish stallion, Flexible, he delivered a double clear and set the tone with a time of 36.28. “I know Flexible pretty well, having shown him at this level for about three years now and I had a pretty good idea how I wanted to ride it,” noted Fellers. For Barrios, a little rub over fence seven in the first round was amplified with the speed that he and Quick Star delivered in the jump-off and down it came, a heart breaker when his time of 35.17 would have put him first. Bond closed out the class with almost the same round. “I got a little bit careful after Pablo had the seven fence down. I should have just kept coming and risked it,” she said with a smile. Ashlee Bond, along with Keean White, Chris Pratt and several more, is headed to Calgary for a five-week series of tournaments and a few more chances to accumulate World Cup points. For Fellers, however, it’s time to rest up before he and Flexible head to Europe in preparation for the World Equestrian Games. Thunderbird Show Park will host their second FEI World Cup show jumping classes – the $75,000 CS12* -W Keg Steakhouse & Bar World Cup – on August 28th as part of the Summer Festival Tournament. Peter Holmes will return as course designer. 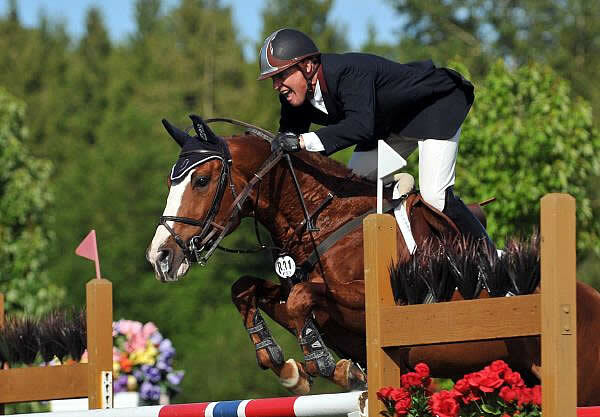 In their 37th season, Thunderbird will host seven major tournaments between May and September, welcoming thousands of competitors and spectators to their 85-acre equestrian show grounds in Langley, BC. Each tournament features both amateur and professional riders in hunter and jumper classes from Wednesday to Sunday. The Park is open daily to the public with grandstand seating around the Fort Grand Prix Field. Visit www.thunderbirdshowpark.com for more information and the full season schedule.